Yesterday, I posted my first image of NROL-27 / USA 227, the SDS satellite launched March 11th. It is located at 30.4 W, over the Atlantic. As discussed before, the patch features a Gryphon (mythical creature, half lion, half eagle): with a lion (and the constellation Leo, the lion) between its legs, and reaching for an eagle (with the constellation Aquila, the eagle). Realizing the eagle could be a metaphor for the USA, I suddenly realized the lion could be a metaphor for Africa. This is interesting given the position and role of USA 227 / NROL-27 over 30.4 W, the Atlantic. In this position it connects Africa, to it's east, with the US, to its Northwest. 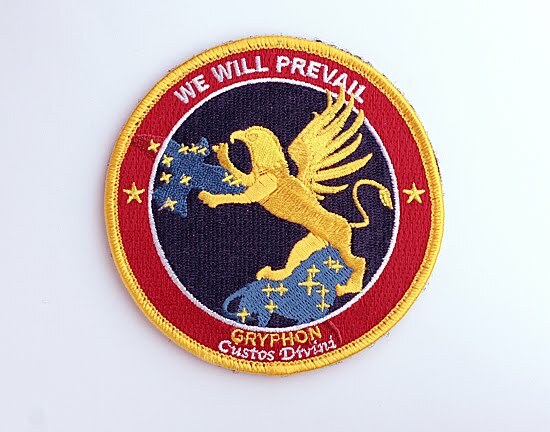 Is this what is depicted in the patch: the Gryphon (NROL-27) reaching from Africa to the US? This would be the role of an SDS satellite: relaying data from reconaissance sats over Africa towards the USA (see also here). If not intentional, than this is a very cool coincidence. Actually the wing is Florida and the head of the Lion is south America. Te stars represent radio transmission hotspots of activity. The Griffin is a multi adaptive predatory animal with the qualities and strengths of many types of predators. Yet another Japanese satellite failure! Sense and non-sense about the X37-B "Space Plane"